Chamomile is a common group name for a number of plants that are similar in nature to daisies and in the Asteraceae family. This well-loved and very ancient herb has earned a place of respect in traditional medicine for its mild and bittersweet taste and its ability to promote a sense of calm for the mind and body. You are probably most familiar with chamomile tea, the relaxing beverage that pairs well with a good book on a rainy day or helps you wind down before bedtime. What is amazing is that there are so many other great reasons to grow chamomile in your garden. It is a great remedy for stress but so much more. Because chamomile is naturally anti-fungal and antibacterial, it makes a wonderful companion plant. I always plant chamomile around fruit trees and bushes to keep fungal infections at bay. Put chamomile around brassicas such as broccoli and kale, onions, beans, and cucumbers. If you plant chamomile next to other herbs such as mint, basil or rosemary it will help increase their oil production. Chamomile draws beneficial insects and pollinators such as wasps, ladybugs, honey bees, and hoverflies. Just as the chamomile plant attracts beneficial insects, it can also be used to ward off damaging pests and keep mosquitoes at bay. Brew double strength tea and add it to a spray bottle. Spray on seedlings to prevent a fungal infection and also on older plants to keep aphids and other unwanted bugs away. I even use chamomile tea to give my plants an extra energy boost. Once your chamomile plant reaches about two feet tall, cut it off two inches from the ground. Break up the leaves, stem etc.. and place it all in an old pillowcase and place it in a 5-gallon bucket of water. Let it sit for at least two weeks, Dilute the tea with clean water in a 3:1 ratio. You can reuse the plant parts for a second batch. Use this diluted tea to water your plants. At the end of the season, cut down and grind your chamomile. Leave in on the ground for a nutritious mulch. You can also throw your old chamomile plants into the mulch pile as they are high in minerals. There are numerous health benefits of chamomile which make it a great addition to any healthy lifestyle. Here are just some of the ways that chamomile can benefit your overall health and wellbeing. The antioxidants in chamomile are linked to an improved immune function, reduced pain and swelling, healthier hair, skin, eyes and teeth and lower rates of mood disorders. Research shows that chamomile is one of the best natural remedies for anxiety and depression. Chamomile soothes the digestive tract and can help ease conditions such as acid reflux, diarrhea, motion sickness, indigestion, nausea, and vomiting. The brain and gut are in constant communication and because of this, a relaxed mind can positively impact conditions such as leaky gut and IBS (irritable bowel syndrome). Because of its powerful anti-inflammatory and pain fighting properties, chamomile is often called the “herbal aspirin”. Chamomile can help fight infections and reduce mucus making it a good choice when you are sick with a cold, sinus infection or the flu. Research shows that inhaling steam infused with chamomile extract or gargling with chamomile tea can help reduce inflammation of the mucous membranes in the mouth and throat. Research shows that the high levels of flavonoids found in chamomile are relative to a lower risk of death from coronary heart disease in older men. 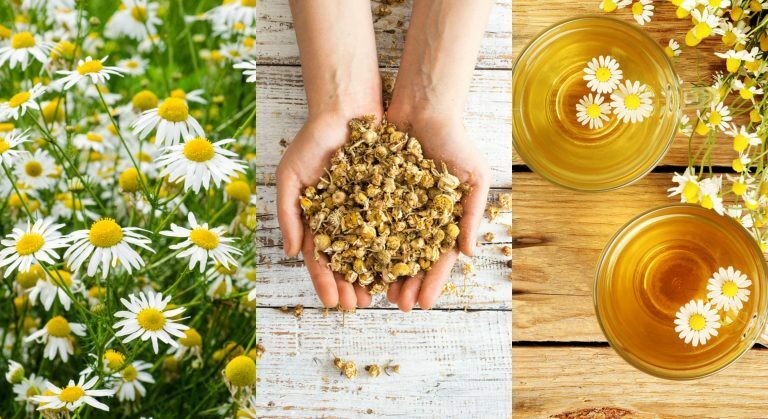 Chamomile antioxidants called apigenin are bioactive constituents that have been found to fight against skin, prostate, breast and ovarian cancer. Before we talk about how to grow chamomile it is important to understand that there are two kinds of chamomile plants, Roman chamomile (Chamaemelum nobile) and German chamomile (Matricaria recutita). The Roman type is a perennial and very low growing while German chamomile is an annual (that will self-sow) that can reach over two feet in height. However, both plants possess similar therapeutic properties. This perennial can be started from seeds, cuttings or root divisions. I find that starting seeds indoors to be the most successful method for me. From seed indoors: Sow seeds indoors 6 to 8 weeks before the last expected frost. Fill small ¾ inch pots with a lightweight potting blend and plant the seeds ¼ inch deep. For best results, keep the soil moist, but not overly wet and the temperature around 70 degrees. You should see some seedling in 14 to 21 days. Once the seedlings emerge, be sure that you are providing plenty of light in a sunny window. When seedlings are 4 weeks old, apply a starter solution fertilizer to give them a boost. Before transplanting, be sure to harden off your tiny plants. Place seedlings in a sheltered location for about a week to protect them from wind and heat. If there is going to be a frost be sure to bring them inside at night and take them out the next morning. Chamomile likes dry conditions and cool temperatures, so if you are in a hot climate, be sure to plant in a partly sunny location. Once established, chamomile is very self-sufficient. There is no need to fertilize or fuss over chamomile. Once established, it which will do well when left alone. German chamomile does well when directly sown into a garden location. Be sure that your location is free of weeds and has plenty of organic matter as the seeds are very tiny. Scatter the German Chamomile seeds on the surface of the soil and tamp them down with the flat side of a hoe. The best time to plant is in early spring about the same time that you would plant peas. Young seedlings will even withstand a light frost. Seeds will germinate in about ten days and grow slow at first. Thin the plants to 12 inches apart when they have two sets of leaves. Keep plants well weeded and moist. Established plants: If you purchase larger plants, it is important to prepare a place free from weeds and with plenty of organic matter. Be sure to water the new plant frequently while it becomes established, do not let the soil dry out completely.